The Cedar River Natural Area contains 226 acres of riparian forest. It includes 6,395 feet of stream frontage on the Cedar River. The acreage is jointly owned by the Village of Bellaire and Antrim County. Land management activities are administered by the Antrim Conservation District. Stop by the ACD office to access the trail head of the Cedar River Natural Area! Click here for a trail map created by Jared Elm, AmeriCorps Stewardship Coordinator. The formation of the Cedar River Natural Area began in July of 2000 when the Antrim County Board of Commissioners approved the purchase of the 77 acres formally known as the Skaff property. 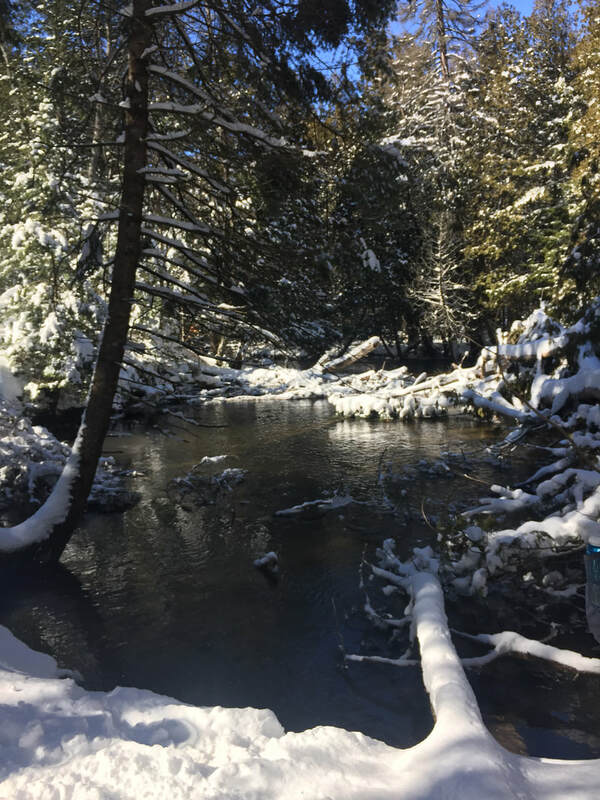 The purchase of the parcel was a joint effort between the Grand Traverse Regional Land Conservancy (GRLC) the Antrim Conservation District (ACD) and Antrim County. The property was purchased to protect the pristine wetlands and riparian forest along the Cedar River as well as to provide recreational opportunities and river access for fishing. This parcel was (is) contiguous to recreational properties owned by the Village of Bellaire increasing its value to the community. In total, the Cedar River Natural Area contains 226 acres of pristine wetland which includes 6,395 feet of stream frontage and 2 miles of hiking trails. S ½, SW ¼, Section 21 with exclusions. The Cedar River Natural Area was purchased for the protection of wetland environments, fisheries and riparian habitats along the Cedar River. In addition to these attributes – the parcel was considered to have outstanding ecological diversity, storm water retention capacities and wildlife habitats. Management philosophies have been aimed at retaining and protecting the existing natural features as well as providing recreational access and environmental education. Currently the primary use of the parcel is for hiking, hunting and fishing. The trail system adjoins the Craven Park campground and the baseball/ softball fields owned by the Village of Bellaire. The Antrim Conservation District continues to up-grade the hiking trails within the natural area. The cost associated with the management of the Cedar River Natural Area has also been the limiting factor regarding property improvements and natural resources management. The following outlines some of the natural resources within the natural area and corresponding needs associated with the management of these resources. The Cedar River Natural Area (CRNA) contains a wide variety of complex forested ecosystems. Forested acreages make up 82 percent of the natural area. Most significant are the lowland conifer forest that make up 50 percent of the forest complex. Here white cedar, hemlock, balsam fir and white pine dominate. Approximately 18 percent of the forest is aspen mixed with declining black ash. As of 2014 – most of the ash has been killed by the emerald ash borer. The remaining forested acres are in plantation red pine, which make up 8 percent of the forest communities. The Cedar River Natural Are contains one of Antrim Counties last remaining undisturbed and undeveloped stream corridors. Here virgin white pine, hemlock and white cedar can be viewed from the trail system that bisects the property. Other tree species include; yellow birch, red maple, balsam fir, spruce, aspen, and ironwood. Individual tree identification signage has been placed throughout the natural area assisting visitor with the identification of trees. Wildlife is abundant within the natural area. The lowland conifer forest type attracts year round resident wildlife populations. The river and river corridor provide travel and habitat requirements for fur bearing animals, birds and reptiles. The natural area is used extensively by wildlife in the winter and serves as a yarding area for deer. In the winter of 2014 it was estimated that 30 – 50 deer over wintered in the natural area. Other wildlife common to the natural area are: bobcat, gray fox, coyote, mink, otter, raccoon, red and gray squirrels, rabbit and hare, beaver, black bear and a variety of local and migratory song birds. Many water fowl species can be viewed from the craven pond. 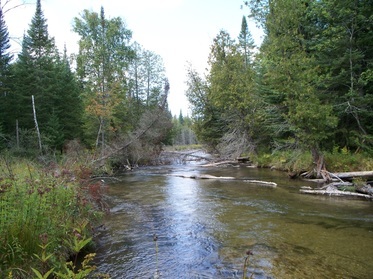 The Michigan Department of Natural Resources (MDNR) has classified the Cedar River as a blue ribbon trout stream. The parcel contains approximately 6395 feet of river frontage. Ownership includes both sides of the river for much of its length. Both brook trout and brown trout are known to exist in the river. The river is open to the public during the established trout season regulated by the MDNR. In 2002 a shocking inventory was conducted by the Grand Traverse band of Ottawa and Chippewa Indians. At this time it was established that 12.3 lbs/ac of trout species (113 trout per acre) existed within the mainstream. Average length of the brown trout was 7.4 inches with an average length of brook trout slightly lower at 6.6 inches. In 2010 the Antrim Conservation District added fish habitat structures to the lower end of the river in an attempt to improve fish populations and reduce back erosion. Walking trails have existed within the property owned by the Village of Bellaire for over 30 years. The Antrim Conservation District in conjunction with the Boy Scouts assisted the village with the installation of trails and bridges to facilitate. With the acquisition of the adjoining properties, the trail system is being expanded. Today over two miles of hiking trails exist within the natural area. Included is the old railroad grade that bisects the property. Most of these trails are unimproved limiting access for some visitors. The Conservation District actively continues to upgrade existing trails. 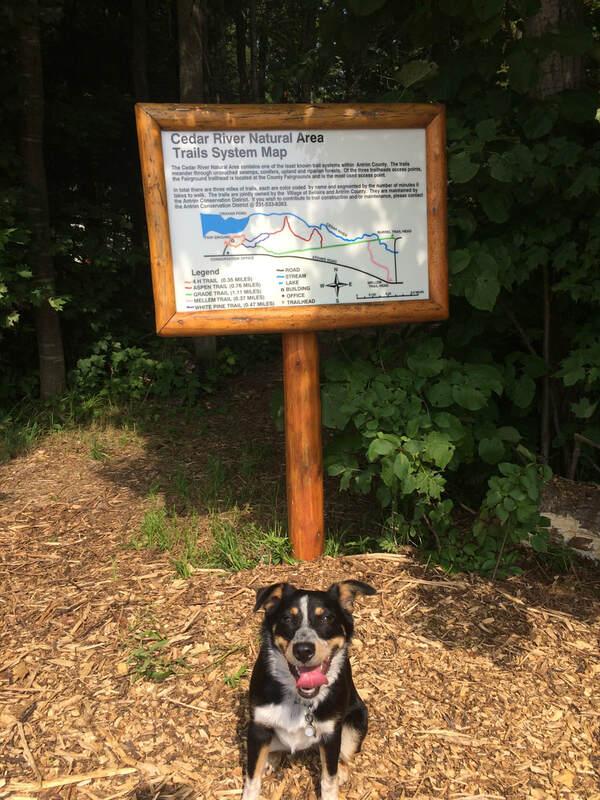 In 2014 interpretive signage and trail head signage was added to the trail system. Trail maintenance remains a high priority.